In November 2015, less than one year after these initial steps toward fully opening relations, PARMA Recordings produced the first of its recording projects in Havana. 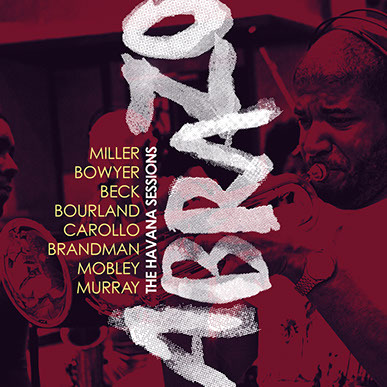 The resulting album, ABRAZO: THE HAVANA SESSIONS on the newly-minted Ansonica Records label, presents works for big band, small jazz combo, choir, and chamber ensembles by composers Bunny Beck, Roger Bourland, Don Bowyer, Margaret Brandman, John Carollo, Timothy Miller, Mel Mobley, and Michael Murray performed by current or former members of the National Symphony Orchestra of Cuba, the Buena Vista Social Club, Irakere, and many more. Spine-tingling sounds abound on the album, particularly on the choral recordings. Roger Bourland’s Alarcón Madrigals, Book 3, set to the bilingual poetry of Francisco X Alarcón, and Michael Murray’s After the Fall, composed to commemorate the first anniversary of the events of September 11, 2001, both veer from hushed, intimate valleys of close harmony to ebullient, expansive peaks of counterpoint. Bunny Beck’s two Jazz Suites, arranged by Juan Manuel Ceruto, take the composer’s work on a tour through beloved Cuban styles such as son, dazon, cha-cha-cha, and more. The ensemble, featuring acclaimed pianist Rolando Luna, plays with a breathless intensity that is frequently contrasted by the delicate, lilting beauty of the compositions. It’s New York jazz by way of the Malecón. The tracks feature vocals by Will Dailey, recording artist, performer and producer, and five time winner in the Boston Music Award: Best Male Singer-Songwriter. In Mel Mobley’s lively trio Coloring with Water, brash brass punches through long melodic lines, navigating complex metric modulations and thorny harmonies. What comes through to the ear, however, is the sound of a composer who knows how to get the listener’s pulse racing. Programmatic concepts are central to John Carollo’s Burlesque and Margaret Brandman’s Warm Winds in Havana. Carollo’s trademark humor and playfulness is in full effect on this coquettish type of pas de deux for trumpet and guitar, while Brandman’s sax quartet is given an exhilarating, penetrating interpretation by Javier Zalba and his ensemble. The intricately interlocked sounds of Cuban percussion augment the latter piece with particular flair. Produced by Havana native Dayron Ortega, PARMA’s Lead Producer in Cuba, the big band recordings on ABRAZO showcase the Cuban sound at possibly its very best. Trombone features prominently in Don Bowyer’s eerily catchy Bugs and Gas, a crackerjack chart rippling with syncopations and grin-inducing counter-melodies, and Tim Miller’s Hot Miami Nights and On An Autumn Day are true show-stoppers – expert arrangements played with both feverish brilliance and true jazz cool. Cuba and America have been separated for far too long. Embrace the sounds of ABRAZO.